Not to be confused with Nassau (town), New York or Nassau (village), New York. Nassau County (/ˈnæsɔː/ or /ˈnæsaʊ/) is a county in the U.S. state of New York. At the 2010 census, the county's population was 1,339,532, estimated to have increased to 1,358,343 in 2018. The county seat is Mineola and the largest town is the Town of Hempstead. Footnotes: Population is 2018 Census estimate. Nassau County is situated in western Long Island, bordering New York City's borough of Queens to the west, and Suffolk County to the east. 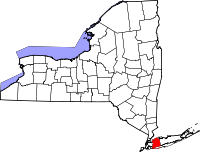 It is the most densely populated and second-most populous county in New York state outside of New York City, with which it maintains extensive rail and highway connectivity, and is considered one of the central counties within the New York metropolitan area. Nassau County contains two cities, three towns, 64 incorporated villages, and more than 60 unincorporated hamlets. Nassau County has a designated police department, fire commission, and elected executive and legislative bodies. A 2012 Forbes article based on the American Community Survey reported Nassau County as the most expensive county and one of the highest income counties in the United States, and the most affluent in the state of New York, with four of the nation's top ten towns by median income located in the county. Nassau County high school students often feature prominently as winners of the Intel International Science and Engineering Fair and similar STEM-based academic awards. The name of the county comes from an old name for Long Island, which was at one time named Nassau, after the Dutch Prince William of Nassau, a member of the House of Nassau, itself named for the German town of Nassau. The county colors (orange and blue) are also the colors of the House of Orange-Nassau. Several alternate names had been considered for the county, including "Bryant", "Matinecock" (a village within the county currently has that name), "Norfolk" (presumably because of the proximity to Suffolk County), and "Sagamore". However, "Nassau" had the historical advantage of having at one time been the name of Long Island itself, and was the name most mentioned after the new county was proposed in 1875. The area now designated Nassau County was originally the eastern 70% of Queens County, one of the original 12 counties formed in 1683, and was then contained within two towns: Hempstead and Oyster Bay. In 1784, the Town of North Hempstead, was formed through secession by the northern portions of the Town of Hempstead. Nassau County was formed in 1899 by the division of Queens County, after the western portion of Queens had become a borough of New York City in 1898, as the three easternmost towns seceded from the county. When the first European settlers arrived, among the Native Americans to occupy the present area of Nassau County were the Marsapeque, Matinecoc, and Sacatogue. Dutch settlers in New Netherland predominated in the western portion of Long Island, while English settlers from Connecticut occupied the eastern portion. Until 1664, Long Island was split, roughly at the present border between Nassau and Suffolk counties, between the Dutch in the west and Connecticut claiming the east. The Dutch did grant an English settlement in Hempstead (now in western Nassau), but drove settlers from the present-day eastern Nassau hamlet of Oyster Bay as part of a boundary dispute. In 1664, all of Long Island became part of the English Province of New York within the Shire of York. Present-day Queens and Nassau were then just part of a larger North Riding. In 1683, Yorkshire was dissolved, Suffolk County and Queens County were established, and the local seat of government was moved west from Hempstead to Jamaica (now in New York City). By 1700, very little of Long Island had not been purchased from the native Indians by the English colonists, and townships controlled whatever land had not already been distributed. The courthouse in Jamaica was torn down by the British during the American Revolution to use the materials to build barracks. In 1784, following the American Revolutionary War, the Town of Hempstead was split in two, when Patriots in the northern part formed the new Town of North Hempstead, leaving Loyalist majorities in the Town of Hempstead. About 1787, a new Queens County Courthouse was erected (and later completed) in the new Town of North Hempstead, near present-day Mineola (now in Nassau County), known then as Clowesville. The Long Island Rail Road reached as far east as Hicksville in 1837, but did not proceed to Farmingdale until 1841 due to the Panic of 1837. The 1850 census was the first in which the population of the three western towns (Flushing, Jamaica, and Newtown) exceeded that of the three eastern towns that are now part of Nassau County. Concerns were raised about the condition of the old courthouse and the inconvenience of travel and accommodations, with the three eastern and three western towns divided on the location for the construction of a new one. Around 1874, the seat of county government was moved to Long Island City from Mineola. As early as 1875, representatives of the three eastern towns began advocating the separation of the three eastern towns from Queens, with some proposals also including the towns of Huntington and Babylon (in Suffolk County). In 1898, the western portion of Queens County became a borough of the City of Greater New York, leaving the eastern portion a part of Queens County but not part of the Borough of Queens. As part of the city consolidation plan, all town and county governments within the borough were dissolved. The areas excluded from the consolidation included all of the Town of North Hempstead, all of the Town of Oyster Bay, and most of the Town of Hempstead (excluding the Rockaway Peninsula, which was separated from the Town of Hempstead and became part of the city borough). In 1899, following approval from the New York State Legislature, the three towns were separated from Queens County, and the new county of Nassau was constituted. In preparation for the new county, in November 1898, voters had selected Mineola to become the county seat for the new county (before Mineola incorporated as a village in 1906 and set its boundaries almost entirely within the Town of North Hempstead), winning out over Hicksville and Hempstead. The Garden City Company (founded in 1893 by the heirs of Alexander Turney Stewart) donated four acres of land for the county buildings in the Town of Hempstead, just south of the Mineola train station and the present day village of Mineola. The land and the buildings have a Mineola postal address, but are within the present day Village of Garden City, which did not incorporate, nor set its boundaries, until 1919. In 1917, the village of Glen Cove was granted a city charter, making it independent from the Town of Oyster Bay. In 1918, the village of Long Beach was incorporated in the Town of Hempstead. In 1922, it became a city, making it independent of the town. These are the only two administrative divisions in Nassau County identified as cities. From the early 1900s until the Depression and the early 1930s, many hilly farmlands on the North Shore were transformed into luxurious country estates for wealthy New Yorkers, with the area receiving the "Gold Coast" moniker and becoming the setting of F. Scott Fitzgerald's 1925 novel The Great Gatsby. One summer resident of the Gold Coast was President Theodore Roosevelt, at Sagamore Hill. In 1908, William Kissam Vanderbilt constructed the Long Island Motor Parkway as a toll road through Nassau County. With overpasses and bridges to remove intersections, it was among the first limited access motor highways in the world, and was also used as a racecourse to test the capabilities of the fledgling automobile industry. Nassau County, with its extensive flat land, was the site of many aviation firsts. Military aviators for both World Wars were trained on the Hempstead Plains at installations such as Mitchel Air Force Base, and a number of successful aircraft companies were established. Charles Lindberg took off for Paris from Roosevelt Field in 1927, completing the first non-stop trans-Atlantic flight from the United States. Grumman (which in 1986 employed 23,000 people on Long Island) built many planes for World War II, and later contributed the Apollo Lunar Module to the Space program. The United Nations Security Council was temporarily located in Nassau County from 1946 to 1951. Council meetings were held at the Sperry Gyroscope headquarters in the village of Lake Success near the border with Queens County. It was here on June 27, 1950, that the Security Council voted to back U.S. President Harry S Truman and send a coalition of forces to the Korean Peninsula, leading to the Korean War. Until World War II, most of Nassau County was still farmland, particularly in the eastern portion. Following the war, the county saw an influx of people from the five boroughs of New York City, especially from Brooklyn and Queens, who left their urban dwellings for a more suburban setting. This led to a massive population boom in the county. In 1947, William Levitt built his first planned community in Nassau County, in the Island Trees section (later renamed Levittown). (This should not be confused with the county's first planned community, in general, which is Garden City.) While in the 1930s, Robert Moses had engineered curving parkways and parks such as Jones Beach State Park and Bethpage State Park for the enjoyment of city-dwellers, in the 1950s and 1960s the focus turned to alleviating commuter traffic. In 1994, Federal Judge Arthur Spatt declared the Nassau County Board of Supervisors unconstitutional and directed that a 19-member legislature be formed. Republicans won 13 seats[clarification needed] in the election and chose Bruce Blakeman as the first Presiding Officer (Speaker). Among the first class of Legislators were Peter J. Schmitt (R-Massapequa), Judith Jacobs (D-Woodbury), John Ciotti (R-North Valley Stream), Dennis Dunne Sr. (R-Levittown), Francis X. Becker (R-Lynbrook), Vincent T. Muscarella (R-West Hempstead), Ed Mangano (R-Bethpage), Michael Fiechter (C-North Bellmore), Roger Corbin (D-Westbury), Salvatore Pontillo (R-Farmingdale), Bruce Nyman (D-Long Beach), Edward Ward (R-Wantagh), Darlene Harris (R-Uniondale), Ed Oppenheimer (D-Rockville Centre), John Canning (R-Sea Cliff), Bruce Blakeman (R-Woodmere), Lisanne Altmann (D-Great Neck), Richard Nicolello (R-New Hyde Park), Barbara Johnson (D-Port Washington). According to a Forbes magazine 2012 survey, residents of Nassau County have the 12th highest median household annual income in the country and the highest in the state. In the 1990s, however, Nassau County experienced substantial budget problems, forcing the county to near bankruptcy. Thus, the county government increased taxes to prevent a takeover by the state of New York, leading to the county having high property taxes. Nevertheless, on January 27, 2011, a New York State oversight board seized control of Nassau County’s finances, saying the wealthy and heavily taxed county had failed to balance its $2.6 billion budgets. Cold Spring Harbor Laboratory on the North Shore of Nassau County is an internationally renowned biomedical research facility and home to eight scientists awarded the Nobel Prize in Physiology or Medicine. South Shore of Nassau County, aerial view. Theodore Roosevelt home at Sagamore Hill. The Belmont Stakes at the starting gate, at Belmont Park, in 2014. Nighttime aerial view of much of Nassau County, from the west-northwest; Hempstead is in the center, with roads projecting out in various directions; bridges to Jones Beach Island are at the upper right. The Grand Central Parkway–Cross Island Parkway interchange, barely visible at the lower left, is just outside the county, within Queens. According to the U.S. Census Bureau, the county has a total area of 453 square miles (1,170 km2), of which 285 square miles (740 km2) is land and 169 square miles (440 km2) (37%) is water. Nassau County occupies a portion of Long Island immediately east of the New York City borough of Queens. It is divided into two cities and three towns, the latter of which contain 64 villages and numerous hamlets. The county borders Connecticut across the Long Island Sound. Between the 1990 census and the 2000 census, the county exchanged territory with Suffolk County and lost territory to Queens County. Dozens of CDPs had boundaries changed, and 12 new CDPs were listed. The Village of Freeport on Baldwin Bay. Nassau County has a climate similar to other coastal areas of the Northeastern United States; it has warm, humid summers and cool, wet winters. The county is classified as humid subtropical by some definitions. The Atlantic Ocean helps bring afternoon sea breezes that temper the heat in the warmer months and limit the frequency and severity of thunderstorms. Nassau County has a moderately sunny climate, averaging between 2,400 and 2,800 hours of sunshine annually. In July 2017, the approval was granted by state legislators to the plan proposed by New York Governor Andrew Cuomo to add a third railroad track to the Long Island Rail Road corridor between the communities of Floral Park and Hicksville in Nassau County. The nearly US$2 billion transportation infrastructure enhancement project was expected to accommodate anticipated growth in rail ridership and facilitate commutes between New York City and Nassau and Suffolk counties on Long Island. The Long Island Expressway, Northern State Parkway, and Southern State Parkway are the primary east-west controlled-access highways in Nassau County. Northern Boulevard (New York State Route 25A), Hillside Avenue (New York State Route 25B), Jericho Turnpike (New York State Route 25), New York State Route 24, and Sunrise Highway (New York State Route 27) are also major east-west commercial thoroughfares across the county. The Meadowbrook State Parkway, Wantagh State Parkway, and Seaford-Oyster Bay Expressway (New York State Route 135) are the major north-south controlled-access highways traversing Nassau County. In 2011, there were about 230,000 Jewish people in Nassau County, representing 17.2% of the population, (as compared to 2% of the total U.S. population). Italian Americans also make up a large portion of Nassau's population. The five most reported ancestries were Italian (23%), Irish (14%), German (7%), American Indian (5%), and Polish (4%). The county's population was highest at the 1970 Census. The New York Times cited a 2002 study by the non-profit group ERASE Racism, which determined that Nassau, and its neighboring county, Suffolk, are the most de facto racially segregated suburbs in the United States. More recently, a Little India (लघु भारत) community has emerged in Hicksville, Nassau County, spreading eastward from the more established Little India enclaves in Queens. Rapidly growing Chinatowns have developed in Brooklyn (布魯克林) and Queens (皇后), with Asian immigrants moving into Nassau County, as did earlier European immigrants, such as the Irish and Italians. As of 2016, the Asian population in Nassau County had grown rapidly to an estimated 118,271 individuals, including an estimated 47,397 Indian Americans and 30,175 Chinese Americans. Likewise, the Long Island Koreatown (롱 아일랜드 코리아타운) originated in Flushing, Queens, and is expanding eastward along Northern Boulevard and into Nassau County. As of the 2010 Census, there were 1,339,532 people, 448,528 households, and 340,523 families residing in the county. The population of Nassau County was estimated by the U.S. Census to have increased by 2.2% to 1,369,514 in 2017, representing 6.9% of the Census-estimated New York State population of 19,849,399 and 17.4% of the Census-estimated Long Island population of 7,869,820. The population density in 2010 was 4,700 people per square mile (1,815/km²). There were 468,346 housing units at an average density of 1,598 per square mile (617/km²). The racial makeup of the county was 73.0% White (65.5% non-Hispanic White), 11.1% African American, 0.2% Native American, 7.6% Asian (3.0% Indian, 1.8% Chinese, 1.0% Korean, 0.7% Filipino, 0.1% Japanese, 0.1% Vietnamese, 0.9% Other Asian), 0.03% Pacific Islander, 5.6% from other races, and 2.4% from two or more races. Hispanic or Latino of any race were 14.6% of the population. In 2010, there were 340,523 family households, out of which 33.5% had children under the age of 18 living with them, 60.0% were married couples living together, 11.7% had a female householder with no husband present, and 24.1% were non-families. 20.1% of all households were made up of individuals and 15.1% had someone living alone who was 65 years of age or older. The average household size was 2.94 and the average family size was 3.38. The population was 23.3% under the age of 18, and 18.7% who were 62 years of age or older. The median age was 41.1 years. For every 100 females, there were 93.7 males. For every 100 females age 18 and over, there were 90.4 males. The median income for a household in the county in 2000 was $72,030, and the median income for a family was $81,246 (these figures had risen to $87,658 and $101,661 respectively according to a 2007 estimate). Males had a median income of $52,340 versus $37,446 for females. The per capita income for the county was $32,151. About 3.50% of families and 5.20% of the population were below the poverty line, including 5.80% of those under age 18 and 5.60% of those age 65 or over. †American Indian, Native Alaskan, Native Hawaiian, and Pacific Islander make up just 0.5% of the population of Long Island, and have been included with "Other". As of the 2000 United States Census, there were 1,334,544 people, 447,387 households, and 347,172 families residing in the county. The population density was 4,655 people per square mile (1,797/km²). There were 458,151 housing units at an average density of 1,598 per square mile (617/km²). The racial makeup of the county was 79.30% White (73.95% White Non-Hispanic), 10.01% African American, 0.16% Native American, 4.73% Asian, 0.03% Pacific Islander, 3.57% from other races, and 2.12% from two or more races. Hispanic or Latino of any race were 10.09% of the population. There were 447,387 households, out of which 35.30% had children under the age of 18 living with them, 63.10% were married couples living together, 10.90% had a female householder with no husband present, and 22.40% were non-families. 18.80% of all households were made up of individuals and 9.40% had someone living alone who was 65 years of age or older. The average household size was 2.93 and the average family size was 3.34. In the county the population was spread out with 24.70% under the age of 18, 7.30% from 18 to 24, 28.90% from 25 to 44, 24.00% from 45 to 64, and 15.00% who were 65 years of age or older. The median age was 38.5 years. For every 100 females, there were 92.80 males. For every 100 females age 18 and over, there were 89.00 males. The median income for a household in the county was $72,030, and the median income for a family was $81,246. Males had a median income of $52,340 versus $37,446 for females. The per capita income for the county was $32,151. About 3.50% of families and 5.20% of the population were below the poverty line, including 5.80% of those under age 18 and 5.60% of those age 65 or over. The head of the county's governmental structure is the County Executive, a post created in Nassau County in 1938. The current county executive is Laura Curran, a Democrat who was elected 2017. The Chief Deputy County Executive is Democrat Helena Williams. The District Attorney is Democrat Madeline Singas, who was elected to replace Kathleen Rice who was elected to the House of Representatives. The county comptroller is George Maragos, a Republican turned Democrat, the county clerk is Republican Maureen O'Connell. Former elected offices Chairman of the County Board of Assessors, County Treasurer, and County Sheriff were made appointed and serve at the pleasure of the County Executive (County Assessor in 2008 via referendum changing it from a 6-year term to appointed). The current Nassau County Executive is Laura Curran, a Democrat and the first woman to hold the position. The Chief Deputy County Executive is the highest appointed official in the Nassau County government, serving 2nd in command under the auspice of the County Executive. The Chief Deputy is responsible for managing the activities of all departments of the Nassau County government, which provides services to its 1.36 million residents. The Chief Deputy also officially serves as the acting County Executive in the absence of, or disability of the County Executive. The current Chief Deputy County Executive is Helena Williams who was appointed by Executive Laura Curran in 2018. The comptroller of Nassau County is the chief fiscal officer and chief auditing officer of the County who presides over the Nassau County Comptroller's Office. The comptroller is elected countywide to a four-year term and has no term limit. The county legislature has 19 members. There are eleven Republicans and eight Democrats. County police services are provided by the Nassau County Police Department. The cities of Glen Cove and Long Beach, as well as a number of villages, are not members of the county police district and maintain their own police forces. The following village police departments exist in Nassau County: Centre Island, Floral Park, Freeport, Garden City, Great Neck Estates, Hempstead, Kensington, Kings Point, Lake Success, Lynbrook, Malverne, Muttontown, Old Brookville (Old Brookville P.D. provides police protection for Old Brookville, Brookville, Upper Brookville, Matinecock, Mill Neck and Cove Neck), Old Westbury, Oyster Bay Cove, Rockville Centre and Sands Point. The Port Washington Police Department is not a village department but is authorized by a special district, the only such district in New York State. These smaller forces, however, make use of such specialized county police services as the police academy and the aviation unit. Also, all homicides in the county are investigated by the county police, regardless of whether or not they occur within the police district. On June 1, 2011, the Muttontown Police Department commenced operations. The Old Brookville Police had formerly provided police services to the Village of Muttontown. In 2006, village leaders in the county seat of Mineola expressed dissatisfaction with the level of police coverage provided by the county force and actively explored seceding from the police district and having the village form its own police force. A referendum on December 5, 2006, however, decisively defeated the proposal. Since the Long Island State Parkway Police was disbanded in 1980, all of Nassau County's state parkways have been patrolled by Troop L of the New York State Police. State parks in Nassau are patrolled by the New York State Park Police. In 1996, the Long Island Rail Road Police Department was consolidated into the Metropolitan Transportation Authority Police. The MTA Police patrol Long Island Rail Road tracks, stations and properties. The New York State Department of Environmental Conservation Police provides enforcement of state environmental laws and regulations. The State University of New York Police provides enforcement for SUNY Old Westbury. The Nassau County Police Department posts the mug shots of DWI offenders as press releases on their website. This practice has come under the scrutiny of residents, media, and those pictured in these press releases. This practice has been criticized as being able to cost potential employees, students, or public figures their positions. County correctional services and enforcement of court orders are provided by the Nassau County Sheriff's Department. New York State Court Officers provide security for courthouses. A Nassau County Auxiliary Police car. The Nassau County Auxiliary Police are a unit of the Nassau County Police Department. These volunteer police officers are assigned to 1 of 38 local community units and perform routine patrols of the neighborhood and provide traffic control for local parades, races and other community events. Auxiliary Police officers are empowered to make arrests for crimes that occur in their presence. Nassau County Auxiliary Police are required to complete a 42-week training course at the Nassau County Police Academy and qualified officers are also offered Emergency Medical Technician (EMT) training. Auxiliary Police officers are certified and registered by the New York Division of Criminal Justice Services as full-time "peace officers". The City of Long Beach has an independent Auxiliary Police force which is part of its municipal police force. These officers are represented by the Auxiliary Police Benevolent Association of Long Island. Nassau County is currently protected and served by 71 independent volunteer or combination paid/volunteer fire departments, organized into 9 battalions. Before, during and for the first four decades after World War II, like neighboring Suffolk County, Nassau County residents primarily supported the Republican Party in national elections. However, in the 1990s, the tide of voter support began to shift toward the Democratic Party. Democrat Bill Clinton carried the county in the presidential elections of 1992 and 1996. Later Nassau voters gave a large plurality of the vote to Al Gore in 2000 (19.4%), while John Kerry's Nassau margin in 2004 was considerably slimmer (5.6%). In that election, Kerry won the towns of Hempstead and North Hempstead, but lost the Town of Oyster Bay. The County went solidly for Barack Obama in 2008 and 2012, and by a similar margin for Hillary Rodham Clinton in 2016. Democratic strength is chiefly concentrated in both the wealthier and more lower income sections of the county. Liberal voters dominate many of the numerous ritzy enclaves of the North Shore, particularly in the town of North Hempstead where affluent villages such as Sands Point, Old Westbury, Roslyn, East Hills, Kensington, Thomaston, Great Neck Plaza, and Great Neck Estates as well as the neighboring city of Glen Cove vote consistently Democratic. Democratic strongholds also include several low income municipalities in the central portion of the county, such as the village of Hempstead, Roosevelt, Uniondale and New Cassel, as well as in a few waterfront communities on the South Shore, such as the city of Long Beach and the village of Freeport. Republican voters are primarily concentrated in the middle to upper middle class southeastern portion of the county, which developed during the "post-war boom-era." Heavily Republican communities such as Massapequa, Massapequa Park, Seaford, Wantagh, Levittown, Bethpage, and Farmingdale are the political base of many county GOP officials such as Congressman Peter T. King and former County Executive Edward P. Mangano. In the western portion of the county, wealthy Garden City is solidly Republican, as is the more middle-class community of Floral Park. Additionally, some of the more rustic areas of the North Shore, particularly in the town of Oyster Bay usually vote for the GOP. Areas of the county containing large numbers of swing voters are in East Meadow, Oceanside, and Rockville Centre on the South Shore and Mineola on the North Shore. Several areas have changed in partisan affiliation. Formerly Democratic strongholds such as the Five Towns have trended to the GOP while previously Republican areas such as Elmont and Baldwin have become Democratic bastions. The dean of the Long Island Congressional Delegation, Representative Peter T. King, is from Nassau County. His 2nd District includes heavily populated suburban neighborhoods like Massapequa, Levittown, Seaford, Wantagh, and Farmingdale. But Nassau County is also home to the popular former district attorney, Democrat Kathleen M. Rice, whose 4th District includes Garden City, Carle Place, Hempstead, Uniondale, East Meadow, Valley Stream, Franklin Square, West Hempstead and portions of the Village of Freeport and Rockville Centre. Nassau County's other two congressmen are both Democrats. Representative Gregory Meeks represents the 5th District, which includes the southwestern part of the county, including Valley Stream. Thomas Suozzi's 3rd District includes Great Neck, Port Washington, Jericho, Syosset, Hicksville, Bethpage, and Glen Cove in Nassau County. Seven out of Long Island's nine state senators are Republican at the start of the 2017–2019 legislative term in January 2017, with the exceptions being State Senator John Brooks and Senator Todd Kaminsky. Nassau County has 56 public school districts, which like post office districts use the same names as a city, hamlet, or village within them, but each sets the boundaries independently. The number of districts and communities do not coincide, therefore the boundaries cannot be the same, and residences often have postal addresses that differ from the name of the hamlet and/or school district in which they are located. Nassau County is home to numerous colleges and universities, including Adelphi University, Briarcliffe College, Hofstra University, Long Island University C. W. Post Campus, Molloy College, Nassau Community College, New York Institute of Technology, SUNY Old Westbury, United States Merchant Marine Academy, and Webb Institute. Nassau has two medical schools, the Donald and Barbara Zucker School of Medicine at Hofstra/Northwell and the New York Institute of Technology College of Osteopathic Medicine, and one law school, the Hofstra School of Law, affiliated with both Hofstra University in Hempstead and New York Institute of Technology in Old Westbury. Nassau County was home to the New York Islanders of the National Hockey League, who played at the Nassau Veterans Memorial Coliseum in Uniondale from their inception in 1972. However, the Islanders announced in 2012 that starting in the fall of 2015, the team would be moving to Brooklyn and would play at the Barclays Center, its present home. Due to issues with Barclays Center being unable to adequately support ice hockey and declining attendance, the Islanders announced that for the 2018-19 season they would split their home games between Barclays Center and the newly-renovated Nassau Coliseum. In December 2017, the Islanders won a bid to build a new 18,000-seat stadium near Belmont Park in Elmont, New York, returning them to Nassau County. The Brooklyn Nets of the National Basketball Association, then known as the New York Nets, formerly played their home games in Nassau County at the now-demolished Island Garden arena in West Hempstead from 1969 to 1972 and then at the Coliseum from 1972 to 1977, before the franchise moved to New Jersey—its original home for several years before coming to Long Island in the late 1960s - and eventually, to Brooklyn. The New York Cosmos (1970-85) of the former North American Soccer League (1968–84) played for two seasons,1972 and 1973, at the James M. Shuart Stadium at Hofstra University in Hempstead, then known as Hofstra Stadium. The team's name was revived in 2010, and the present-day New York Cosmos (2010) of the new North American Soccer League play at Shuart Stadium. Nassau County is also the home of the Long Island Lizards of Major League Lacrosse, who play at Shuart Stadium. The County also operates several sports events for student-athletes, such as the Nassau County Executive Cup College Showcase. Belmont Park in Elmont is a major horse-racing venue which annually hosts the Belmont Stakes, the third and final leg of the prestigious Triple Crown of thoroughbred racing. The now-demolished Roosevelt Raceway in Westbury hosted auto racing and, from 1940 through 1988, was a popular harness racing track. Nassau is home to some famous and historic golf courses. Rockaway Hunting Club, founded in 1878, is the oldest country club in the country. The U.S. Open has been held in Nassau five times, once each at Garden City Golf Club, Inwood Country Club, and Fresh Meadow Country Club, and twice at Bethpage Black Course, the first ever municipally owned course. Courses consistently ranked in the top 100 in the U.S. such as Bethpage Black, Garden City Golf Club, Piping Rock Club, and The Creek are located in the county. ^ a b "State & County QuickFacts Nassau County, New York". United States Census Bureau. Retrieved April 21, 2019. ^ Toy, Vivian S. (March 30, 2003). "For Sale: Nassau's County Seat". The New York Times. The county's properties all have mailing addresses in Mineola, the official county seat, but are actually within Garden City's boundaries. ^ "NCPD: Nassau County Police Department". Nassau County. Retrieved August 16, 2014. ^ "Nassau County Fire Commission". Nassau County. Retrieved February 24, 2013. ^ "Governmental Structure: Nassau County". Nassau County. Retrieved January 8, 2010. ^ a b "America's Most Affluent Neighborhoods". Forbes.com. February 13, 2012. Retrieved October 25, 2012. ^ "Student Science a Resource of Society for Science & the Public". Society for Science & the Public. Retrieved July 18, 2017. ^ "About Nassau County". Retrieved November 11, 2012. ^ "Last will and testament of Thomas Powell Sen late of Bethpage now of Westbury in the limits of Hempstead in Queens County on Nassau Island in the Colony of New York". 1719. Retrieved November 11, 2012. ^ a b "Long Island" (PDF). New York Times. April 12, 1875. Retrieved November 11, 2012. ^ a b "Long Island" (PDF). New York Times. April 9, 1876. Retrieved November 11, 2012. ^ a b "Proposed Division of Queens County" (PDF). New York Times. December 21, 1876. Retrieved November 11, 2012. ^ "Early Five Borough's History". Retrieved December 30, 2007. When Queens County was created the courts were transferred from Hempstead to Jamaica Village and a County Court was erected. When the building became too small for its purposes and the stone meeting house had been erected, the courts were held for some years in that edifice. Later a new courthouse was erected and used until the seat of justice was removed to North Hempstead. ^ "Old Bethpage Village Restoration". Retrieved April 22, 2012. ^ "History of Queens County". "Historical Essay: A Thumbnail View". Official History Page of the Queens Borough President's Office. Archived from the original on December 18, 2007. Retrieved December 29, 2007. From the final withdrawal of the British in November, 1783, until the 1830s, Queens continued as an essentially Long Island area of farms and villages. The location of the county government in Mineola (in present-day Nassau County) underscores the island orientation of that era. Population grew hardly at all, increasing only from 5,791 in 1800 to 7,806 in 1830, suggesting that many younger sons moved away, seeking fortunes where land was not yet so fully taken up for farming. "New York – Queens County – History". Retrieved December 29, 2007. Sullivan, James (1927). "History of New York State 1523–1927". New York, Chicago: Lewis Historical Publishing Company, Inc.
"New York State History". Genealogy Inc. 1999. Archived from the original on January 8, 2008. Retrieved December 28, 2007. Under the Reorganization Act of March 7, 1788, New York was divided into 120 towns (not townships), many of which were already in existence. "State of New York; Local Government Handbook; 5th Edition" (PDF). January 2000. pp. Ch 4, p 13, Ch 5 p 2. Archived from the original (PDF) on February 15, 2010. The 1777 New York State Constitution, Article XXXVI, confirmed land grants and municipal charters granted by the English Crown prior to October 14, 1775. Chapter 64 of the Laws of 1788 organized the state into towns and cities...The basic composition of the counties was set in 1788 when the State Legislature divided all of the counties then existing into towns. Towns, of course, were of earlier origin, but in that year they acquired a new legal status as components of the counties. "History Mysteries: Shelter Island Ferry/Mineola Building". Archived from the original on July 6, 2008. Retrieved April 1, 2008. The building shown below "is one of the most important buildings in the history of Mineola," wrote Jack Hehman, president of the Mineola Historical Society. Built in 1787 and known as the "old brig," it was the first Queens County courthouse and later a home for the mentally ill. The building was at Jericho Turnpike and Herricks Road until 1910, when it burned to the ground. David Roberts. "Nassau County Post Offices 1794–1879". Retrieved April 1, 2008. John L. Kay & Chester M. Smith, Jr. (1982). New York Postal History: The Post Offices & First Postmasters from 1775 to 1980. American Philatelic Society. There was only one post office established in present Nassau County when the Long Island post road to Sag Harbor was established September 25, 1794. It appears that the mail from New York went to Jamaica. This was the only post office in the present day Boroughs of Queens or Brooklyn before 1803. From Jamaica the mail went east along the Jericho Turnpike/Middle Country Road route and ended at Sag Harbor. The only post office on this route between Jamaica and Suffolk County was QUEENS established the same date as the others on this route 9/25/1794. This post office was officially Queens, but I have seen the area called "Queens Court House" and was located approximately in the Mineola-Westbury area. The courthouse was used until the 1870s when the county court was moved to Long Island City. Later it served as the Queens County Insane Asylum and still later as an early courthouse for the new Nassau County, during construction of the present "old" Nassau County Courthouse in Mineola. It was demolished shortly after 1900 ... after about 120 years of service of one type or the other. "1873 map of North Hempstead". Archived from the original on June 10, 2007. Retrieved December 31, 2007. bottom right by spur road off Jericho Tpk – location is now known as Garden City Park. Clowesville was the name of the nearest station on the LIRR, approximately at the location of the present Merillon Avenue station. The courthouse (photo at Newsday.com ) was north of the station. ^ Weidman, Bette S.; Martin, Linda B. (1981). Nassau County, Long Island, in early photographs, 1869–1940. Courier Dover. p. 55. Retrieved December 2, 2010. ^ The former county courthouse was located northeast of the intersection of Jericho Turnpike (NY Route 25) and the aptly named County Courthouse Road in an unincorporated area of the Town of North Hempstead, variously referred to in the present day as Garden City Park or New Hyde Park. The site is now a shopping center anchored by a supermarket and is located in the New Hyde Park 11040 ZIP Code. A stone marker located on the north side of Jericho Turnpike (NY Route 25), between Marcus Avenue and Herricks Road, identifies the site. ^ a b Rhoda Amon (Staff Writer). "Mineola: First Farmers, Then Lawyers". Newsday. Archived from the original on October 15, 2008. Retrieved November 11, 2012. That was the year when the "Old Brig" courthouse was vacated after 90 years of housing lawbreakers. The county court moved from Mineola to Long Island City. "Queen's County Court House" (PDF). New York Times. February 14, 1870. Retrieved November 11, 2012. "Long Island" (PDF). New York Times. December 5, 1870. Retrieved November 11, 2012. "The Queens County Court-House Question" (PDF). New York Times. February 25, 1872. Retrieved November 11, 2012. "A Queens Timeline". The Queens Tribune. Archived from the original on November 9, 2007. Retrieved December 23, 2007. 1874 – Queens County Courthouse and seat of county government moved from Mineola (in present-day Nassau County) to Long Island City. "The New Queens County Court-House" (PDF). New York Times. February 9, 1874. Retrieved November 11, 2012. ^ Geoffrey Mohan (Staff Writer) (2007). "Nassau's Difficult Birth; Eastern factions of Queens win the fight to separate after six decades of wrangling". Newsday. Archived from the original on October 16, 2008. Retrieved November 11, 2012. North Hempstead, Oyster Bay and the rest of Hempstead were excluded from the vote. ^ "Mineola Chosen Nassau County's Seat". New York Times. November 10, 1898. Retrieved June 6, 2010. ^ "County of Nassau Elections". New York Times. September 1, 1898. Retrieved June 6, 2010. ^ "Incorporated Village of Garden City: History". Incorporated Village of Garden City. Archived from the original on July 19, 2011. Retrieved June 6, 2010. "Sites for Nassau County Buildings". New York Times. September 29, 1898. Retrieved June 6, 2010. "The History of Nassau's County Seat". rootsweb. Retrieved June 6, 2010. ^ Fischler, Marcelle S (November 15, 1998). "An Immigrant's Vision Created Garden City". The New York Times. Retrieved June 6, 2010. ^ Antonia Petrash; Carol Stern & Carol McCrossen. "HISTORY OF GLEN COVE". ^ a b Stoff, Joshua. "The Aviation History of Long Island". Cradle of Aviation Museum. Archived from the original on November 27, 2012. Retrieved November 17, 2012. ^ "Long Islanders Shocked by Grumman's Merger". The New York Times. March 8, 1994. Retrieved November 17, 2012. ^ McQuiston, John T. "Judge Says He Will Create a Nassau Legislature on His Own if Supervisors Fail to Act", The New York Times, June 9, 1994. Retrieved December 11, 2007. ^ McQuiston, John T. "Amid Pomp, Nassau County Inaugurates Its Legislature", The New York Times, January 13, 1996. ^ "New York State Takes Control of Nassau's Finances". The New York Times. January 27, 2011. Retrieved January 27, 2011. ^ a b "New York: 2000 Population and Housing Unit Counts" (PDF). September 2003. p. III-9. Retrieved March 12, 2012. ^ "united states annual sunshine map". HowStuffWorks, Inc. Archived from the original on April 29, 2011. Retrieved December 18, 2011. ^ Areas touching Nassau County, MapIt. Accessed March 19, 2017. ^ Sophia Hall (July 12, 2017). "New York Senate Republicans OK $1.9B In Funding For 3rd LIRR Track". CBS New York. Retrieved July 15, 2017. ^ "NY Jewish Population on the Rise for First Time in Decades". Archived from the original on June 6, 2013. ^ Alan Krawitz. "Hicksville: LI's LITTLE INDIA". Newsday. Retrieved April 17, 2013. ^ Lawrence A. McGlinn, Department of Geography SUNY-New Paltz (2002). "BEYOND CHINATOWN: DUAL IMMIGRATION AND THE CHINESE POPULATION OF METROPOLITAN NEW YORK CITY, 2000" (PDF). Journal of the Middle States Division of the Association of American Geographers. Middle States Geographer. 35: 110–119. Archived from the original (PDF) on October 29, 2012. Retrieved April 7, 2016. ^ a b Carol Hymowitz (October 27, 2014). "One Percenters Drop Six Figures at Long Island Mall". Bloomberg L.P. Retrieved April 7, 2016. ^ "ACS DEMOGRAPHIC AND HOUSING ESTIMATES 2012-2016 American Community Survey 5-Year Estimates - Nassau County, New York". United States Census Bureau. Retrieved April 26, 2018. ^ Asian Americans: Contemporary Trends and Issues Second Edition, Edited by Pyong Gap Min. Pine Forge Press - An Imprint of Sage Publications, Inc. 2006. ISBN 9781412905565. Retrieved April 7, 2016. ^ a b Kirk Semple (June 8, 2013). "City's Newest Immigrant Enclaves, From Little Guyana to Meokjagolmok". The New York Times. Retrieved April 7, 2016. ^ a b John Roleke. "Flushing: Queens Neighborhood Profile". About.com. Retrieved April 7, 2016. ^ "Koreatown Manhattan, or Koreatown Flushing?". CBS Interactive Inc. June 2009. Retrieved April 7, 2016. ^ Joyce Cohen (March 23, 2003). "If You're Thinking of Living In/Murray Hill, Queens; The Name's the Same, the Pace is Slower". The New York Times. Retrieved April 7, 2016. ^ a b c d "2010 Census Profile for Nassau County". ^ a b "2010 Census brief" (PDF). ^ a b c DP-1: Profile of General Demographic Characteristics: 2000 from the Census 2000 Summary File 1 (SF 1) 100-Percent Data for Nassau County, New York, United States Census Bureau. Accessed March 19, 2017. ^ DP-3: Profile of Selected Economic Characteristics: 2000 from the Census 2000 Summary File 3 (SF 3) - Sample Data for Nassau County, New York, United States Census Bureau. Accessed March 19, 2017. ^ "Deputy County Executives | Nassau County, NY - Official Website". www.nassaucountyny.gov. Retrieved January 24, 2017. ^ Leip, David. "Dave Leip's Atlas of U.S. Presidential Elections". uselectionatlas.org. Retrieved October 23, 2018. ^ "Public School Districts in Nassau County, NY". Retrieved November 11, 2012. ^ a b Flocker, Michael (2002). Vermont: The Green Mountain State. Gareth Stevens. p. 41. Retrieved July 3, 2014. ^ LA MONICA, MARK. "Chris Weidman honored by Nassau executives with 'Chris Weidman Day'". Newsday. ^ Helwani, Ariel. "Nassau County to proclaim July 17 as 'Chris Weidman Day'". MMA Fighting. Wikimedia Commons has media related to Nassau County, New York. Wikivoyage has a travel guide for Nassau County.